*Recipe posted 04/29/13. Images updated 06/07/16. When I originally had this sweet and salty combination in my head, I couldn’t decide if I should make granola bars or blondies. I settled on granola bars, because I wanted to have something somewhat healthy to snack on in the house. However, as soon as I tasted the chocolate caramel pretzel granola bars, I knew that I had to use this combination in blondies. Plus, I discovered that I only have a few other blondies recipe on here! That had to change! Since I had half open bags of chocolate chips and caramel bits sitting in my cupboard waiting to be used, it didn’t take long for these salted chocolate caramel pretzel blondies to come into existence. 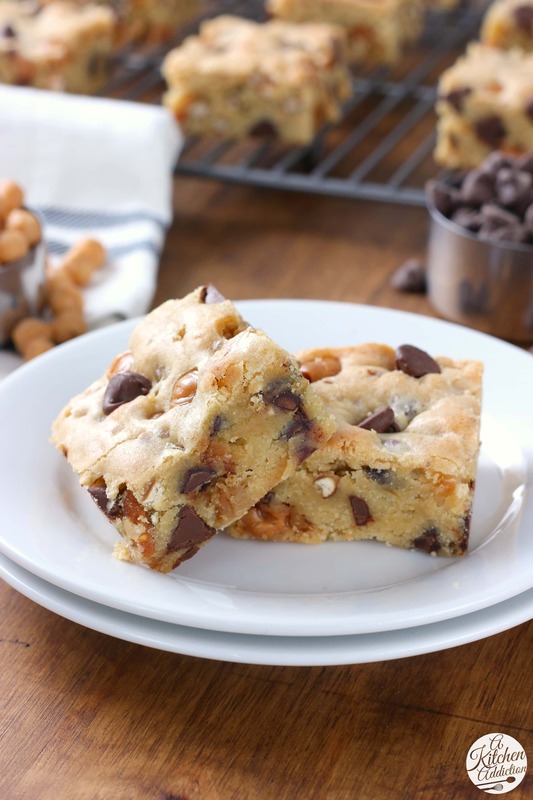 The rich blondie base is stuffed with chocolate chips, caramel bits, and crushed pretzels! To top it off, the blondies are sprinkled with sea salt right before baking. The result? 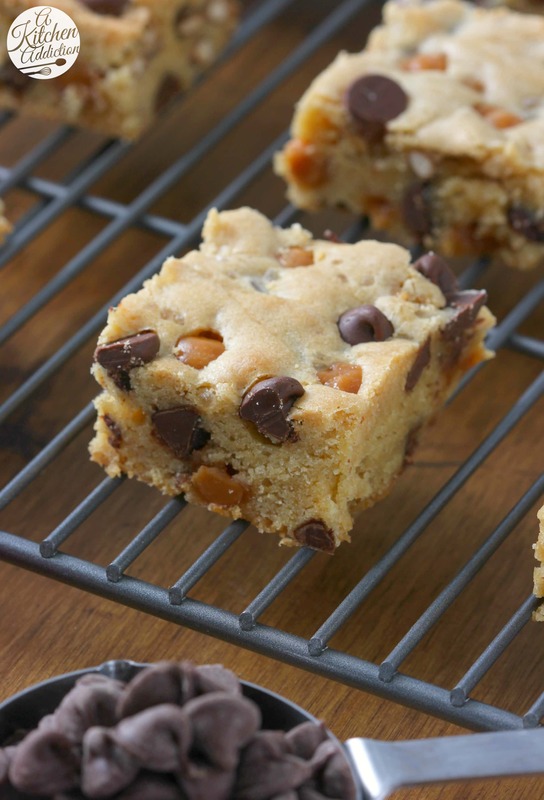 Addicting blondies that may last a day in your house, if you’re lucky. I strongly recommend making a double batch! Stir in pretzels, chocolate chips, and caramel bits. Dough will be thick. 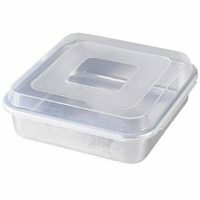 Spread dough into prepared baking dish. Sprinkle with coarse salt. 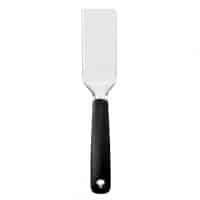 Allow to cool for 20 minutes before cutting into pieces. These brownies are insane. Like…take them away, commit them, because they are LOONY TUNES! Sorry….my metaphor got out of hand. My brain gets fried when it sees so much deliciousness. Haha, these would definitely not last long in my house! I am powerless to resist the combination of salty and sweet in desserts! 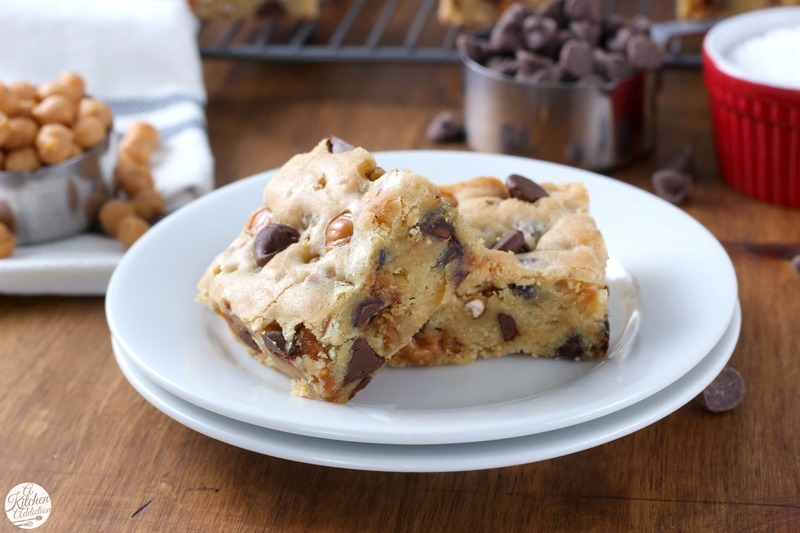 These blondies not only have great things mixed into them, but look really dense and chewy – how blondies should be! I never used to be a blondie fan but now I love them! There are so many combinations you could make with them. Love your combo! Oh yum! These are the best combo! Oh YUM! These look so good. my kiddos would love them for sure! How wonderful do THESE look? I’m almost afraid to try them for fear of addiciton – I just might take the chance t hough! Thanks for the beautiful post! These are some super spectacular blondies! I love the crunch from the pretzels. You had me at salted, then at chocolate, then at caramel, then at… well, ALL THE THINGS, really. This dessert is my favorite already! Yes! these sound incredible Jessica! These would make my Monday a verrrry happy one! Amazing recipe, Jessica! I am dying for blondies – and I think this is the version I’m craving! SO delish! I have only recently become obsessed with blondies and I looove them! This sweet/salty combo sounds perfect!! Can’t wait to try it! You just can’t beat salty/sweet! I love salted caramel anything. And adding pretzels to desserts. So good!! These look ridiculous, Jessica! Love the flavour combo just as much as I did with the granola bars, and these look perfectly moist and thick. Love this sweet and salty combo- sounds wonderful. Just think if you added brown butter to these- that would take it over the top! Love the salty sweet flavor of the blondes! The perfect use for the half empty bags of caramel and chips! These look incredible. I can’t wait to try them!! What a delicious combo of flavors, Jessica! They look amazing!!! ok, i need to make these. like right now. they look AMAZING!! How perfect are these?! Sweet and salty.. you can never go wrong! I love a salty-sweet treat, such a great blondie! I am in love with the addition of the sea salt on top! Yummmmmy! Oh my goodness – those look amazing! I have only had blondies a couple times now and they are one of my faves. Can’t wait to try these 🙂 Pinned to share! This is an amazing addition to your blondie section! I want a whole batch to myself…! This is just what I need when I want comfort in a dessert. It has every element I could want in a dessert – beautiful! 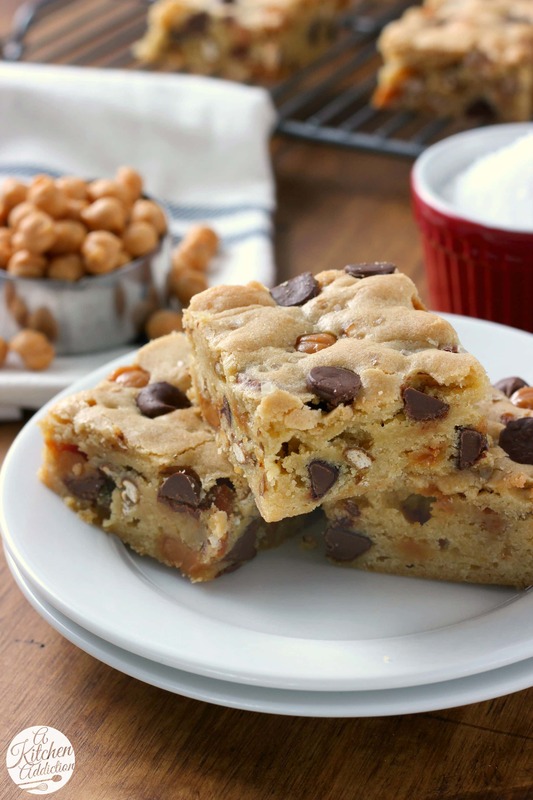 I loooove a sweet + salty dessert and these blondies look SO good. I’d kill for one right now as an afternoon snack! I am glad you went with blondies, these look incredible! The bars look so moist and you can’t go wrong with that sweet & salty combination of flavors! I have a salted caramel pretzel blondie recipe I posted last month! Love the combo! Oh my goodness!!! These look RIDICULOUSLY good! I love the combo of the salty pretzels with the chocolate and caramel. Yum! Sorry for the delayed response, I’ve been having some major computer issues! 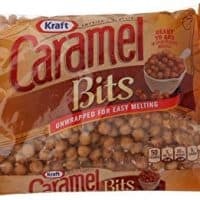 Here is a link to the Kraft website showing what they are: http://www.kraftbrands.com/caramels/products/default.aspx They are basically just little caramel pieces. Hope this helps! Great mash-up idea. I love the salty-sweet combo. Hi Jessica – these are absolutely amazing!!! Saw thse on Facebook today and drooled. Love these blondies and what a great combination. Anything with caramel and pretzels is A-OK in my book. Absolutely a double batch. THIS is my love language. I love a good salty sweet dessert and blondies are one of my faves! These blondies seriously satisfy all my cravings! I think I would do anything for one of these for dessert today! The salted chocolate and caramel combination with the crunchy pretzel is perfection. There is no way I would be able to share these. Pinning to make sure I make them the next time my hubs is out of town, LOL. What heavenly bars!!! I love the add ins—I wouldn’t be able to keep myself away!!! Wonderful! I don’t usually make sweets but these are so tempting! Maybe for Father’s Day?!! Yum! I really like the sweet and salty combination! Sometimes the “end of the bag” results end up being the BEST! 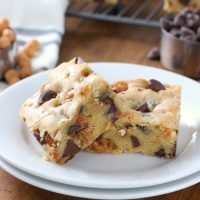 Loving these sweet and salty blondies and wishing I could grab a big bite! Do you know I’ve never made a blondie!? I would love these! I love blondies! And yours are chock full of so many yummy sweet and salty ingredients! Tons of deliciousness in every bite!!! There is nothing I don’t LOVE about these. Salted caramel, pretzels, chocolate…OMG. Mmmmm, these look incredible! Gorgeous photos. Any chance of ever sharing the chocolate caramel pretzel granola bar recipe? Because they sound wonderful, too!